Escape the urban bustle at Bellevue Beach and Teijo national park. 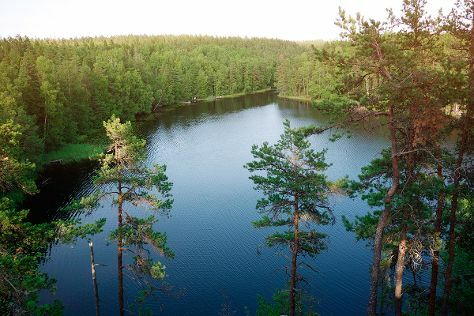 You'll discover tucked-away gems like The Archipelago Trail and Tulliniemi Nature Path. Venture out of the city with trips to Nuuksio National Park (in Espoo), Old Rauma (in Rauma) and Gunnarstrand (in Hanko). Spend the 14th (Sun) exploring nature at Ekenas Archipelago National Park. The adventure continues: get your game on at Moomin World, examine the collection at Luostarinmaki Handicrafts Museum, stay fit while traveling at Ispoinen Beach and Sauna, and take in nature's colorful creations at Kultaranta Garden. To see ratings, traveler tips, reviews, and other tourist information, read Turku vacation planner. If you are flying in from Lithuania, the closest major airport is Turku Airport. In July, daily temperatures in Turku can reach 24°C, while at night they dip to 13°C. Wrap up your sightseeing on the 14th (Sun) to allow time to travel back home.